Home Dog Care Can Humans Get Worms from Dogs? When owners bring their dogs to my clinic to deal with worms, they will often ask, can humans get worms from dogs? The simple answer is yes. In this article I will explain how we can contract worms from our pets, and the many different preventative measures you can take to protect your family from contracting them. We'll also discuss the different types of worms and the symptoms you're likely to see with each different type. Worms are small parasites that can infest your dog’s stomach, small intestine, and other organs – the afflicted area does depends on the type of worm contracted. Worms are usually picked up by your dog from eating infected feces, mosquito bites or from snuffling around in infected soil. These worms can be passed on to you from stroking him, coming into contact with his feces or from walking barefoot on grass or soil that he has previously infected. While it isn't very likely, humans can get worms from dogs. The best way to deal with worms in dogs is to use some type of deworming medicine, but other methods are available. Before we continue onto our discussion about how can humans get worms from dogs, you need to learn the symptoms that you should be looking for. So can humans get worms from dogs? Yes, this can definitely happen. Unfortunately, it is possible to catch worms from your dog. As I mentioned, it's not incredibly common, but you can get worms from your dog simply by doing ordinary things like petting him or walking barefoot through the garden. With any of these parasites, you will almost definitely require medical attention. Book an appointment with your doctor immediately, and inform him that you think that you might have picked up a parasite from your dog. He will most likely conduct blood, and/or stool tests to determine whether you have worms. From there, the best form of treatment will vary depending on the type of worms you have. Not only can humans get worms, there are many different types of worms that your dog can pick up and pass on to you. I’ll run through each type of worm, what they are, how you can pick them up and what symptoms to look out for. You may notice that your dog has these parasites as they will be visible in his poop. They look a little like spaghetti and are a light color. They live inside of, and feed off of a dog’s intestine. 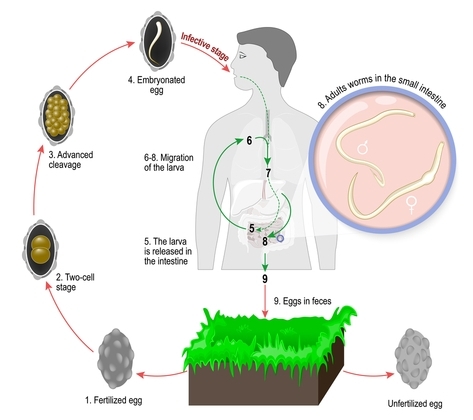 Roundworm eggs fall off of infected dogs. If your dog heads to the dog park and rough houses with his other canine buddies, he’ll likely pick up these eggs from his friend's fur. Later on, when your dog grooms himself he can pick these eggs up with his tongue. Then, they can be passed on to you when you stroke his face or even when playing fetch. These little blood suckers can be fatal to puppies, and dogs with weakened immune systems. One of the easiest ways to spot a hookworm infestation is to check to see whether your dog’s gums, or ears look pale. A healthy dog’s ears and gums will have a pinkish hue, but in an infected or anemic dog, they will look almost white. You can’t see hookworms with the naked eye as they’re so small, therefore medical testing is always needed to accurately diagnose. If you’re taking your dog to the vet, you can make their job easier by being aware of the symptoms. It will make it much easier to narrow down the tests required. Hookworms are picked up by contact with infected soil, or excrement. Most commonly a human will contract this when walking barefoot through the garden. I know, it’s almost irresistible on a nice warm summer’s day. But, for the sake of your health, I’d consider investing in comfy flip flops! If you feel as though all of the fail safes have let you down, and you have picked up Hookworms, this is a very serious condition, and can be deadly. Seek immediate help if you notice any of the symptoms. These worms are usually passed on by fleas, which the dog accidentally ingests when licking himself. Tapeworms aren’t usually life threatening and will mainly cause irritation. This irritation will likely cause your dog to scoot along the floor in an attempt to alleviate some of the irritation. It’s incredibly rare for humans to get tapeworms from dogs, but it has been known to happen. The only way to pick up tapeworm from your dog, is to swallow an infected flea that has fallen from his body. Every dog owner dreads the diagnosis of heartworm. These parasites are notoriously dangerous and time consuming to treat. This type of worm is passed on through the bite of an infected mosquito. There is no other way for a dog to develop heartworm. Can humans get worms? Yes, but it's impossible for them to get heartworms from their dogs. Humans cannot develop heartworm through contact with an infected animal. The only possible way to contract this is through the bite of an infected mosquito. As the question on whether humans can contract heartworm from their dogs is such a hot topic, we decided to include this type of worm on our list. Heartworm is one of the most difficult conditions to spot, as there aren’t always visible symptoms until later stages of the condition. This is very unfortunate, because a lot of damage has already been done. If you've been asking yourself “Can humans get worms from dogs?”, you've probably also been wondering about other diseases and parasites that you may be able to contract from your pet, how to prevent and deal with them. It's an important question. We love our dogs, but they aren't the most hygienic animal. What this means is that there are numerous diseases you need to be mindful of if you're a dog owner. Not only can humans get worms, they can contract rabies, Lyme disease and other common ailments from their pets. Can humans get rabies from dogs? Although not as common as it once was, this virus accounts for up to 50,000 human deaths per year. Affecting the brain, and spinal cord, the disease is passed on through saliva, so even a small nip from an infected animal can prove life threatening. The incubation period is two to eight weeks post bite before you’ll see any of the initial symptoms. Unfortunately, there is no test yet available for rabies in dogs, and the only known test that has some level of success requires collecting brain tissue. This means that the patient will be already deceased before a diagnosis is made. This disease is common in both humans and canines. Transmitted by ticks, this condition causes inflammation of the joints and can often be diagnosed by astute owners who notice a change in their pets gait. A bite from a tick is all that it can take to develop this lifelong condition. Unfortunately, there is no definitive cure for this condition. The only way to alleviate the symptoms is through diet, exercise and correct medical treatment. Can humans contract toxoplasmosis from dogs? Toxoplasmosis is a bacterial infection is seen more often in cats, but can occur in dogs, and humans also. An infected dog will most likely pick up the disease through snuffling around in infected soil, or eating raw meat infected with the bacteria. The symptoms for this ailment, along with the fact that it isn’t very common in dogs, can make the condition difficult for a veterinarian to diagnose. Toxoplasmosis is often misdiagnosed as distemper or rabies. While incredibly rare, contact with infected dog or cat feces can cause you to become infected. More commonly transmitted by cats than dogs, steering clear of touching animal feces with your bare skin will be your best plan of action to avoid developing this infection. The average, healthy human wouldn’t even notice that they had contracted toxoplasmosis. The symptoms manifest themselves to be almost identical to that of the flu, and healthy individuals should be able to overcome this without medical intervention. If you’re worried that you may be suffering from toxoplasmosis and any of the three above symptoms occur, contact your doctor immediately. Can humans get salmonella from dogs? This infection is picked up from raw meat, eggs or the saliva or feces of another infected animal, according to studies. With the potential to cause severe symptoms in infected dogs, owners are advised to seek immediate veterinary attention. A small nip, or even lick from your dog can be enough to give you with this horrible infection. Now that we've answered the question “Can humans get worms?”, we need to discuss how to prevent them. There are some simple things you can do every day to drastically reduce your chances of contracting worms from your pooch. Coming in contact with animal feces is one of the most common ways to pick up worms from your pet. For that reason, you should always be sure to use either good set of gloves or specific dog poop bags and dog pooper scoopers when picking up dog's poop. Keeping a strict de-worming schedule is not only important for your health, but for your pets too. And, if you also have children in your household, contracting worms can be especially damaging to them. Can humans get worms? Yes! But it's much less likely if you stay safe and de-worm your pets. Pet beds for dogs can be a cesspool of bacteria. Owners make the mistake of washing these far too infrequently. In fact, your pet bed should be washed just as frequently as you would wash your own bedding. Just a walk in the park can be enough to come into contact with worms, bacteria, and viruses. Keeping a bottle of hand sanitizer in your pocket might just save you from a bout of sickness in the future! In the hot summer, that watering hole might look like the ideal spot to take a dip or to let your dog take a dip. But, you might just want to think again – specifically about the parasites and bacteria that can lurk in those murky waters. I’m not talking about your dinner – but your dog's. If you cook your dog meat, you absolutely have to check that it’s cooked to the same level that you would expect if you were to consume it. If your dog contracts worms from uncooked meat, there is a likelihood that he could pass that onto you. Ward off these parasitic carriers with a homemade or shop bought repellent. They're the hardest thing to control, but with some effort, you can decrease the chance of mosquito bites on your dog and thereby preventing some instances of worms. Does your dog sleep on your bed? Or maybe he just jumps on the bed from time to time. Either way, parasites can survive on your bedding for weeks and make their way into your system while you sleep. Here are some ways you can fight worms if you believe you've contracted them from your dog. Note that some of these cannot be used to fight worms in dogs because things like garlic are toxic to canines. Including a healthy dose of coconut oil not only benefits your immune system enabling you to fight off parasitic infections easier, but the triglycerides will help you to expel those pesky little critters. Not the most fun solution, garlic is one of the most successful natural anti-parasitic treatment. All you need to do is eat three raw cloves of garlic per day! Specifically recommended to rid those suffering from intestinal worms, add two heaped tablespoons of pumpkin seeds to hot water, and allow to steep for thirty minutes prior to drinking. These seeds have properties that work like a stun gun for parasites, causing them to lose their ability to hold onto your digestive tract – and be painlessly eliminated by the body. These veggies are rich in Beta Carotene, the precursor to Vitamin A which is known to help destroy internal parasites. These pungent herbs have been hailed for their medicinal properties. Perhaps because of the strong smell and taste, they aren’t utilized all too often. Make yourself a nice cup of clove tea by taking a teaspoon of crushed clove and steeping in hot water for ten to twenty minutes before drinking. Now for the miracle spice, as if there weren’t enough uses for turmeric already. From face masks, to allergy relief, this spice is used in a vast array of home remedies. Who knew that we could add parasite killer to the list? Add one teaspoon of turmeric to your food daily to help kill off parasites. We've answered the question can humans get worms from dogs and I've given you some home remedies to fight worms. If you prefer traditional medicine, there are some treatments for worms in humans that are very effective. The most common form of treatment for a worm infestation in humans is to prescribe a anthelmintic. This is a drug that either causes the body to expel the parasites, or kill them. Recovery from a worm infestation is surprisingly almost immediate – with most courses of medication rendering the patient parasite free within a matter of days. While it’s always best to head to your doctor, some medications are available to purchase from your local pharmacy. However, you would need to have a very clear idea of what you’re suffering from. If your dog has been diagnosed with a specific parasite, for example, bringing along a note from your veterinarian will help your pharmacist to accurately suggest a treatment, if available. Not only can humans get worms, they can be extremely dangerous to our bodies. It's best to seek treatment as soon as possible.